I'm back! Last week I moved my baby into his college dorm room, and now I'm an empty nester. How crazy is that? The good news is that he LOVES his school, has already made some great friends, and couldn't be happier. This weekend I put all of my students' birthdays into my plan book and discovered that I have one per week for the next two months! Good thing today is Made in Minutes with My Creative Time! I whipped up this cute little card for one of my girls whose birthday is this week. Since I wanted it to fit in the little polka-dotted envelope that I made with the Scallop Stitched Envelope Die, I made this a 3" x 4" card. I cut a patterned layer using the Simple Stories SN@P Color Vibe collection, and then added a white layer that I had embossed with the Cuttlebug Seeing Spots embossing Folder. The sentiment, from It's All About You, is heat embossed with black embossing powder. For an extra touch, I added a little felt heart made with one of the Stitched Heart Layering Dies. This is so awesome Katie! Your student is going to LOVE it!!! SUPER cute card Katie! 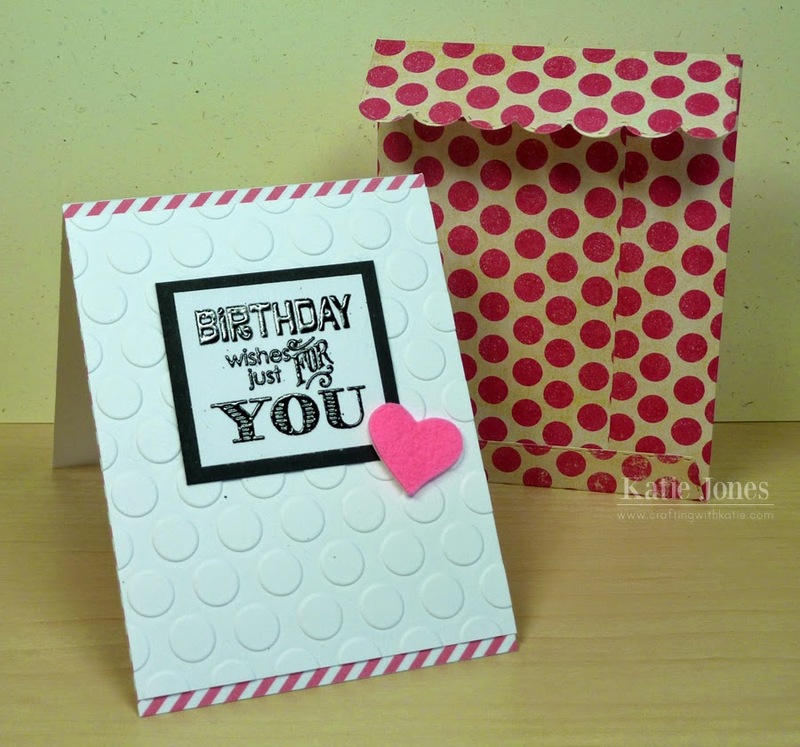 I LOVE that polka dot paper! She is going to love it!!! Katie ~ Hahahaha ~ I started my post off something like this too! So happy to hear you have Eric all settled and that you are back! Well this is the SWEETEST birthday card! LOVE the embossing with that sentiment ( both embossing's btw) and the fun paper!! AMAZING as always! Beautiful simple card...one lucky little girl who gets this beauty! I like the embossing and envelope dots. Great job! So glad Eric is happy and making the right friends! Good job Mom! I think it is so sweet that you make cards for your students! I bet they really appreciate your thoughtfulness! Your card is beautiful!! Hugs! !